Ask fellow campers about "Beeds Lake State Park" and nearby attractions. We were at Beeds Lake State Park in Hampton, Iowa a couple of years ago and I did a review on it then. Things are the same as they were then. We had a back in site on our previous visit, but this time we ended up in a "parallel parking" site. This time we arrived during the county fair which takes place close by and the place was full. Our parallel parking site worked out just fine, although I chose it because it was on the end of the row and with a bit more elbow room than most. The 50 amp electric was solid and restrooms and showers were okay. I had a decent 4G signal until each evening. At that point the signal was strong enough but I think all the fair goers were overloading the system. Because of trees I was unable to get the Dish western arc satellites so I swapped out LNB's and aimed for the eastern arc which I got with no problems. Our feeling about Beeds Lake is about the same as it was before: it's a nice spot if you are okay with electric only, an odd parking setup, and being 10 miles or so off of I35. 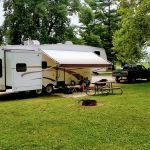 We camped at Beeds Lake State Park in a Fifth Wheel. 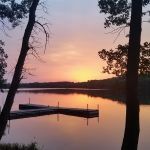 Beeds Lake State Park is well-known and popular with the locals and is otherwise just a bit too far off the beaten track of I-35 in northern Iowa to be discovered by travelers journeying between Des Moines and Minneapolis. A short 10 mile drive east from I-35 brings you to a pretty, tree-lined lake and state park. 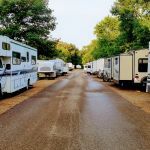 The campground is more or less divided between RV sites and grassy tent sites, and the RV sites are somewhat divided again between a few pull-through sites or more or less standard back-in sites around the parameter of the campground and "parallel parking" campsites up and down the roads in the middle of the campground. Those campsites are interesting to say the least. RVs line up in "parallel parking" mode, with the people opposite one another sharing a grassy strip between them. Over the Independency Day weekend several RVs were so close end-to-nose that the fellow in back had to wait for the folks in front to get hooked up and out before they could hookup to move. All the above seemed to work and the grassy strips between the lines of campers looked like one, big happy block party. When the campground isn't packed the parallel parking sites function at convenient pull-throughs. The lake was built by the CCC a long time ago and they built a large stone "stair step" dam that functions as a beautiful waterfall. You might want to know that all the RV sites are 50/30 amp only with no water or sewer hookups. There are water spigots scattered around the campground so it's easy enough to fill up with fresh water upon arriving. However, there is only one dump station for the entire campground. After the busy weekend there was a line of people waiting their turn at the dump station. The campground boasts a couple of new shower houses and restrooms. I had a clear sky for satellite TV and my Verizon phone got a weak, but working, 4G connect. We often heard the trains in the near distance but it wasn't a big deal. We camped at Beeds Lake State Park in a Fifth Wheel. There's a 2 mile trail around the lake - easy walking, pretty. 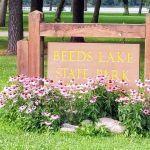 Are you affiliated with Beeds Lake State Park ?